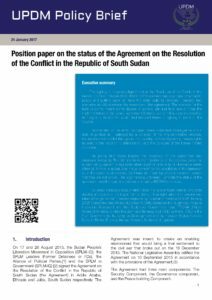 The signing of the peace Agreement on the Resolution of the Conflict in the Republic of South Sudan (ARCRSS) in 2015 sparked cautious hope for a road to peace and putting back on track the state building process. However, two scenarios would determine the relevance of the agreement. The scenario for the best outcome meant some degree of political will and trust would move the implementation of the peace agreement forward, some milestones are reached with signs of economic upturn and reduced levels of fighting in parts of the country. The scenario for the worst outcome means continued intransigence and a lack of political will illustrated by a collapse of the implementation process, resumed violent conflict throughout the country, increased poverty, human rights abuses, further economic deterioration, and the collapse of the formal market economy. This policy brief looks beyond the relevance of the agreement and examines its legality. The brief points to the importance of the process given that a law-making system is legitimate when a prima facie duty of obedience exists either (a) if there is actual unanimous consent to the jurisdiction of the lawmaker or, in the absence of consent, (b) if laws are made by procedures which assure that they are not unjust. The arguments put forward illuminate the status of the agreement and the legal implications of allowing ARCSS to collapse. The grave consequences of which bear highly significant risks to long term stability and peace in the region for not doing things right, when the lessons and rules of the game aren’t heeded anymore by those who mediated the 9th January 2005 Comprehensive Peace Agreement (CPA,) between the Sudanese Peoples Liberation Movement and the Sudanese Government least TROIKA (United States of America, United Kingdom and Norway) and IGAD partners. IGAD is the Inter Governmental Authority on Development and its member States include: Djibouti, Eritrea, Ethiopia, Kenya, Somalia, Sudan and Uganda.